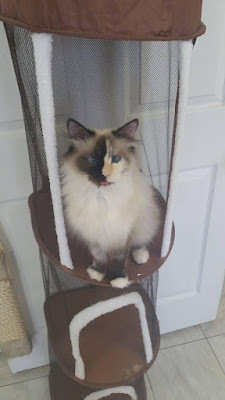 Carma Poodale : Its #NationalCatDay and @PetSmart Is Giving A Chance To Win FREE Food! Its #NationalCatDay and @PetSmart Is Giving A Chance To Win FREE Food! Today is #NationalCatDay!! There are many cats like Possum who would love to have a home of their own. Possum is available from the Owensboro Humane Society in Owensboro Ky.
Upload a pic of your #cat and tag @PetSmart with the hashtag #NationalCatDay for a chance to win 1 yr of Muse Cat Food! For every photo shared, Blogpaws will donate $1.00 to the Winn Feline Foundation up to $1,000. This ends at midnight tonight. Now get those photos of your cats ready and share, share, share! Oh also kiss and hug your kitty. I thought it was too. Blogpaws gives back. That is one of the reasons that I love them.